In dissociated neurons, Topiramate inhibited the persistent fraction of Na+ current in a dose-dependent manner. 25 ~ 100 mg/kg; i.p. Topiramate (25 ~ 100 mg/kg, i.p.) produced a dose-dependent elevation in the threshold for clonic seizures induced by intravenous infusion of ATPA, a selective agonist of GluR5 kainate receptors.
. Taverna S, Sancini G, Mantegazza M, Franceschetti S, Avanzini G. Inhibition of transient and persistent Na+ current fractions by the new anticonvulsant topiramate. J Pharmacol Exp Ther. 1999 Mar;288(3):960-8.
. Kaminski RM, Banerjee M, Rogawski MA. Topiramate selectively protects against seizures induced by ATPA, a GluR5 kainate receptor agonist. Neuropharmacology. 2004 Jun;46(8):1097-104. 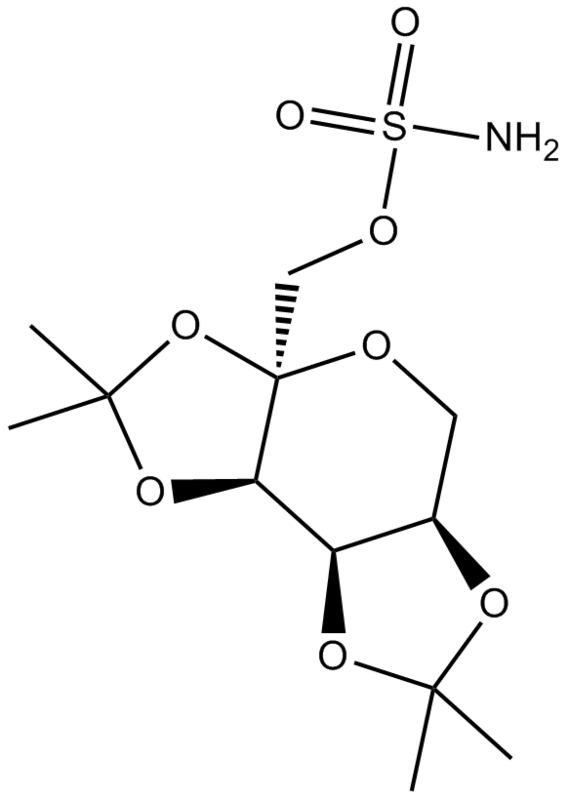 Topiramate, a novel anticonvulsant drug, is a widely used antiepileptic agent. The drug has been reported to interact with various ion channel types, such as AMPA/kainate receptors, voltage-sensitive Na+ channels, NMDA receptors and GABA receptors [1,2]. In vitro:In principal neurons of the rat basolateral amygdala, low concentrations of topiramate selectively inhibited pharmacologically isolated excitatory synaptic currents mediated by kainate receptors with the GluR5 subunit with an IC50 value of 0.5 μM. Topiramate also partially depressed predominantly AMPA-receptor-mediated EPSCs with lower efficacy . In dissociated neocortical slices, low concentrations of TPM (25–30 μM) slightly inhibited the persistent fraction of Na+ current and reduced the Na+-dependent long-lasting action potential shoulders evoked in layer V pyramidal neurons after Ca2+ and K+ current blockade. TPM (100 μM) had no effects on the voltage dependence of activation but induced a leftward shift of the steady-state INaf inactivation curve . In vivo: TPM treatment significantly improved the 24-h neurological deficit scores (high dose, 1.17 ± 0.41; low dose, 1.75 ± 0.5; p < 0.05 for both doses). The percentage of infarct volume (low dose, 22.9 ± 8.9%, p = 0.002; high dose 7.6 ± 3.4%, p < 0.001) reduced when compared with the controls (infarct size, 54.2 ± 9.0%; neurobehavior score, 2. 67 ± 0.52). Higher dose of TPM induced more neuroprotection than that of lower dose (p < 0.05). In a rat model of focal ischemia, treatment with TPM 2 h after MCA embolization resulted in neuroprotective effect in a dose- and use-dependent manner . Topiramate (25-100 mg/kg, i.p.) dose-dependently elevated the threshold for clonic seizures induced by infusion of a selective agonist of GluR5 kainate receptors ATPA . Topiramate (i.p) effectively suppressed acute seizures induced by perinatal hypoxia in a dose-dependent manner with an ED50 of 2.1 mg/kg . Topiramate (20 and 40 mg/kg i.p.) dose-dependently inhibited both tonic and absence-like seizures. In DBA/2 mice, topiramate inhibited sound-induced seizures with ED50 of 8.6 mg/kg (p.o) . Gryder D S, Rogawski M A. Selective antagonism of GluR5 kainate-receptor-mediated synaptic currents by topiramate in rat basolateral amygdala neurons[J]. The Journal of neuroscience, 2003, 23(18): 7069-7074. Yang Y, Shuaib A, Li Q, et al. Neuroprotection by delayed administration of topiramate in a rat model of middle cerebral artery embolization[J]. Brain research, 1998, 804(2): 169-176. Taverna S, Sancini G, Mantegazza M, et al. Inhibition of transient and persistent Na+ current fractions by the new anticonvulsant topiramate[J]. Journal of Pharmacology and Experimental Therapeutics, 1999, 288(3): 960-968. Kaminski R M, Banerjee M, Rogawski M A. Topiramate selectively protects against seizures induced by ATPA, a GluR5 kainate receptor agonist[J]. Neuropharmacology, 2004, 46(8): 1097-1104. Koh S, Jensen F E. Topiramate blocks perinatal hypoxia‐induced seizures in rat pups[J]. Annals of neurology, 2001, 50(3): 366-372. Nakamura J, Tamura S, Kanda T, et al. Inhibition by topiramate of seizures in spontaneously epileptic rats and DBA/2 mice[J]. European journal of pharmacology, 1994, 254(1-2): 83-89.